Another action-packed adventure from the new master of fantasy. 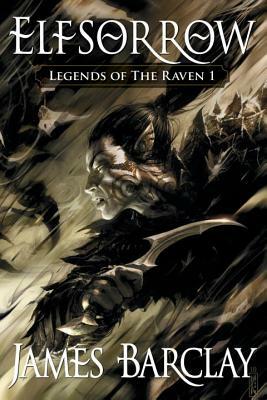 The Raven travel to a new continent in search of mages to help the ruined college of Julatsa rebuild and find themselves in the midst of an ancient curse—a curse that has unleashed a plague that threatens to wipe out the elven race. Barclay excels with another tale that pitches The Raven against the clock and unseen foes. Full of desperate fights and secret betrayals, the story also fills in more of Balaia’s history and delves deeper into the ancient emnities between the colleges. Barclay has created a wonderfully appealing group of heroes, and with every book their history grows and the land they live in becomes wider and richer. This is landmark fantasy in the making. "LOTR fans take note! James Barclay's newest addition [Elfsorrow]…has all you could possibly want in a tantalizing epic adventure…Mr. Barclay's characterization is above the norm, with countless different peoples and races, heroes and bad guys that will all remain in the reader's mind for a long time after. And his creative, technical magic is part fantasy, part Sci-Fi mix, bringing his world-rules to vivid life. If you're looking for a unique, hard action, deeply plotted Sci-Fi/Fantasy epic then you owe it to yourself to read the first in this new series. You will cheer right along with the Raven heroes, find yourself caught up in the battles, and not want to put the book down until you're finished!"